NobelPeace Prize winner, economist and humanitarian Muhammad Yunus, PhD, will deliver the keynote address at Emory University’s Rollins School of Public Health's diploma ceremony May 14. Spurred by a vision for lifting people out of poverty, Yunus began making personal loans of small amounts of money to destitute basket-weavers in his native Bangladesh in the mid-1970s. He ultimately established the Grameen Bank in 1983 to create and advance a world-wide effort toward eradicating poverty through microlending - a new category of banking that would grant millions of small loans to poor people with no collateral. Yunus’ efforts helped establish the microcredit movement across the developing world and beyond, for which he was awarded the Nobel Prize in 2006. Replicas of the Grameen Bank model operate in more than a hundred countries. "Around the world, the poorest people tend to be the unhealthiest, and Dr. Yunus has devoted his impressive career to lifting people out of poverty, which can be a conduit for promoting healthy behaviors and improving health outcomes,” says James W. Curran, MD, MPH, dean of the Rollins School of Public Health. 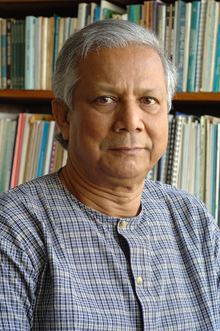 Yunus studied at Dhaka University in what was then East Pakistan, now Bangladesh. He received a Fulbright scholarship to study economics at Vanderbilt University, where he received a PhD in economics in 1969. The following year he became an assistant professor of economics at Middle Tennessee State University. Returning to Bangladesh after it achieved independence in 1971, he headed the economics department at Chittagong University. Yunus has been a member of the International Advisory Group for the Fourth World Conference on Women, a post to which he was appointed by the United Nations secretary general, and has served on the Global Commission of Women's Health, the Advisory Council for Sustainable Economic Development, and the United Nations Expert Group on Women and Finance. He is a member of the board of the United Nations Foundation. He established the Yunus Centre in 2006 as an economic policy resource center to disseminate his philosophy and practices. The recipient of numerous international awards for his ideas and endeavors, Yunus will be honored with conferral of the degree of Doctor of Letters at Emory University's main commencement ceremony also held on May 14.